Today is election day. Make sure you get out and vote. Let your voice be heard. These are challenging times for firearms owners. There are many groups and politicians in this country who want to ban all handguns, ban all semi-automatic rifles, and yes, even repeal the Second Amendment. If you believe in the Constitution, believe in the Second Amendment, it is vital that you get to the polls and cast your vote. There are many other important issues at stake in this election — control of Congress, infrastructure spending, foreign policy, immigration policy, Federal Lands policies, and that’s just on the national level. State and local elections are important too. So be an involved citizen and exercise your right to vote. The NRA Institute for Legislative Action states: “Our Second Amendment rights are being threatened by the anti-gun forces like never before. If you have been following the news, more than likely you have seen the fervor with which our opponents are pushing their agenda. Share the post "Vote This Election Day — Let Your Voice Be Heard"
The election is now just one week away. This is not just about who will become President. With Supreme Court appointments at stake, this election could have significant, long-term consequences for gun owners’ rights under the Second Amendment. We may be at an historic juncture in our nation’s history. If control of the U.S. House and Senate changes, and if anti-Second Amendment Supreme Court Justices are appointed, then things could change in very bad ways for the shooting sports. In the video below, National Shooting Sports Foundation President/CEO Steve Sanetti asks all gun owners to go to the polls armed with the facts. Exercise your right to vote. Remember, every vote counts. The lawful commerce in firearms and [your] rights … to enjoy the shooting sports are squarely at issue this year. And this election is about far more than just the Presidential candidates. Control of both Houses of Congress, the Supreme Court, and all the important appointments and executive orders that the next President can make, are all at stake. And your State and local elections can also affect your ability to enjoy your rights to manufacture, sell, own, and use firearms. So please — don’t sit this one out. Your vote, and every vote, counts. Learn where all the candidates stand, talk to your family, your friends and your coworkers, and vote! This election is up to you, and America is counting on you! Share the post "Why All Gun Owners Should Vote in the Upcoming Election"
Allan D. Cors of Naples, Florida was elected by the National Rifle Association Board of Directors as President of the 144-year-old Association. The election took place in Nashville, Tennessee following the 144th Annual Meeting of the NRA. A lifelong hunter and competitive shooter with a passion for collecting World War II military vehicles, Cors has served as president of the NRA Foundation and is a member of the NRA’s Executive Committee. He was a principal advocate for the establishment of the NRA’s Political Action Committee. Cors served as a counsel with the Judiciary Committee in the U.S. House of Representatives. He also served as the director of government affairs and senior vice president at Corning for 34 years. The board of directors also re-elected Wayne LaPierre as NRA’s executive vice president. LaPierre has served in this leadership role since 1991 and has spearheaded NRA’s efforts to restore the relevance and sanctity of the Second Amendment. Upon his re-election, LaPierre reappointed Kyle Weaver to the position of executive director of NRA General Operations and Chris W. Cox to the position of executive director of NRA Institute for Legislative Action. Pete Brownell was elected NRA First Vice President. Brownell, who previously served as NRA Second VP, is also the current chairman of the National Association of Sporting Goods Wholesalers (NASGW), an active member of the U.S. Army’s Command and General Staff Foundation Board, and vice chair of the Iowa Economic Development Authority Board. NASCAR legend Richard Childress of North Carolina was elected NRA Second Vice President, filling the spot formerly held by Pete Brownell. 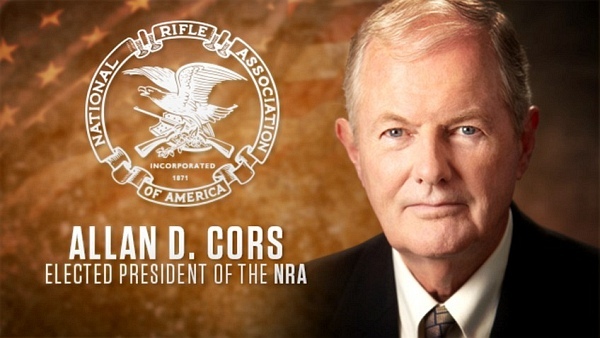 Share the post "Allan Cors Elected President of NRA"
If you don’t know your designated polling place, visit Google’s Polling Place Locator Page. This webpage accesses polling place venues nationwide, based on street address and zip code. Type in your home address (with zip code), and the Polling Place Locator finds your exact polling place, complete with a street map. This webpage includes a “Ballot Summary” so you can preview the candidates and ballot measures in your location. Share the post "Get Out and Vote Today… Your Vote Matters"
Chris Cox, Exec. Director of the NRA Institute for Legislative Action (NRA-ILA), recently interviewed Gov. Mitt Romney, GOP Presidential candidate. Cox posed a number of questions relating to the Second Amendment and firearms regulations. We recommend that you visit NRAILA.org and read the Full Interview with Gov. Romney. Chris Cox: First, let me start with the most basic question of all. In the 2008 case District of Columbia v. Heller, and in the 2010 case McDonald v. City of Chicago, the U.S. Supreme Court—by a 5-4 majority—held that the Second Amendment guarantees the fundamental, individual right of all law-abiding Americans to keep and bear arms. Do you agree that the Second Amendment protects a fundamental, individual right to own and use firearms for all lawful purposes? Gov. Mitt Romney: Absolutely, and I was pleased when the Court finally rendered a clear and concise decision on this critical issue. The Second Amendment is essential to our free society. I strongly support the right of all law-abiding Americans to exercise their constitutionally protected right to own firearms and to use them for lawful purposes, including self-defense; the protection of family and property; hunting and recreational shooting. Chris Cox: Obviously, America’s 100 million gun owners are very concerned that their Second Amendment rights hang in the balance at the U.S. Supreme Court by just one vote. President Obama’s two nominees to the Court so far—Justices Sotomayor and Kagan—have a history of anti-gun opinions and activism. And some have predicted that if Barack Obama is re-elected, he may have the opportunity to nominate several more justices to the Court. As president, if you had the opportunity, what type of individuals would you nominate to the Supreme Court? And which of the justices currently serving on the Court would you consider to be the best models of your judicial philosophy? CLICK HERE to Read Full Interview with Gov. Mitt Romney. The 2012 Presidential race is shaping up as a close contest. With two months left before election day, many key “swing states” remain “too close to call”. Accordingly, experts believe that this election could go either way, meaning both Presidential candidates have a real chance to win in October. Some polls show President Obama maintaining a slight lead in the popular vote, while other forecasters predict Gov. Mitt Romney will secure enough Electoral College votes to win. In a tight election like this, your vote DOES matter. That’s why, no matter what your party affiliation, we encourage you to register and vote in the upcoming election. Share the post "NRA ILA Interviews Presidential Candidate Mitt Romney"
You’ve heard by now that Republican presidential candidate Mitt Romney has chosen Wisconsin Congressman Paul Ryan as his vice presidential running mate. Since Ryan’s selection as a VP candidate, the mainstream media has focused primarily on Ryan’s positions on government spending, health care policies, and debt reduction. Voted YES to protect the right of hunters to use traditional ammunition. Voted YES to prohibit suing manufacturers and retailers for the criminal misuse of firearms. Voted YES to decrease background check waiting period from 3 days to 1 day for a firearm purchase at a gun show. Supported national cross-state standard for concealed carry. Opposed the gun registration & trigger lock law in Washington, DC. Share the post "Vice Presidential Candidate Paul Ryan Supports Gun Rights"
Share the post "Video Reminds Gun Owners to Register and Vote"
Election Day 2008 — Be Sure to VOTE TODAY! Today is the day. Across the nation citizens will vote to determine the next President of the United States. And the Presidential race is not the only important election. Numerous key seats in the U.S. Senate and House of Representatives are up for grabs. Make no mistake about it… this is a very important election. Its outcome will have a significant effect on our domestic and foreign policies for years to come. Whatever your political affiliation you owe it to yourself, and to your country, to exercise your right to vote. Sportsmen and gun owners can influence this election, particularly in key “swing states” such as Pennsylvania, Florida, and Ohio. If we, as gun owners, don’t get to the polling places and cast our ballots, we can expect greater challenges to our rights in the months and years ahead. Also remember that some of the worst gun regulations have started at the municipal and state levels. You must, therefore, pay close attention to state and local elections. Successful efforts to safeguard gun rights begin at the local level. In states like California and New York, we’ve seen that state politicians are more than willing to enact bad laws that violate the Constitutional right to keep and bear arms. So… if you want to keep your Second Amendment rights, be sure to exercise another Constitutional right and VOTE! If you’re not sure about the location of your designated polling place, visit GoVote.org. That non-partisan website will identify your polling place, complete with a street map. Just type in your zip code or street address, and the right location will appear. Share the post "Election Day 2008 — Be Sure to VOTE TODAY!"